Before I can share my thoughts on the subject, it’s important that we first define what the “top of the funnel” is. I’ve learned that far too often when salespeople and executives talk about the top of the funnel, they’re really talking about the top of the bottom of the funnel (if you’re lucky). As more pressure is being put on marketers for lead generation and sales contribution, I’m seeing more of marketers fall into this trap as well. To keep it simple (you can read more detail here) you must understand that the top of the funnel is all about learning, understanding and engaging. It’s about your ideal client profile and persona’s world. It is not about your products, solutions, claims or sales pitches. Adding right-fit leads to the top of your funnel is extraordinarily valuable, because demand is generated at the top of the funnel, it is merely fulfilled through the middle and bottom. Additionally, the best place to separate your company and offerings from your competition is at the top of the funnel, before the lead/prospect is thinking about alternatives and competitors. If your sales team isn’t regularly adding new right-fit leads to the top of your marketing funnel, you’re losing out on significant revenue creation opportunities. Here are five ways salespeople can create this type of value for their company (while making their job much easier in the future). I was talking with Ryan, my VP, Sales & Services, about our sales plan for 2018. We’re in good shape from the work that we’ve done over the last year, plus, we had a very strong fourth quarter and have a solid pipeline going into the first quarter. This focus puts more people in the top of our funnel, where we’re able to nurture, educate and solidify our relationships. This will not only lead to more sales in the short term, but give us a jumpstart to hitting our growth targets for 2019 and 2020 as well. Make no mistake, we have clear sales objectives for the year and the first quarter, but the focal point of our sales efforts is to generate more good conversations. For example, Ryan’s primary objective for Q1 is to develop 175 right-fit people that he can have a conversation with (if you’d like to be one of those 175, just click here, Ryan would be happy to talk with you). More importantly, more than two thirds of the “conversation slots” Ryan has have absolutely no expectation of become a sales opportunity for six months or longer. The focus is on having conversations where we can be helpful. Being helpful means helping without expectation of reciprocity. This again is what the top of the funnel is all about. Prospect resistance disappears, and honesty enters the picture. Prospects initiate the sales conversation, oftentimes faster than you’d planned. Prospects tell even more people about how helpful you are, filling up even more of your “conversation slots,” necessitating the need to hire more salespeople to create more slots. By being helpful first, salespeople are able to engage with more people. Combine that with the right process (more on that below) and that means more leads in the top of your funnel for marketing. One of the biggest missed opportunities to generate more top-of-funnel activity is through the use of email. Every day, billions of emails are sent from salespeople in an effort to find new sales opportunities to pursue. Maybe a fraction of 1% of those emails actually puts any thought to being relevant to someone who is not actively engaged in a potential buying process. One of the most effective ways we’ve been able to drive right-fit leads into our orbit is by always including a top-of-the-funnel focus in the prospecting and general emails we’re sending out. We focus on key pieces of content that are aligned with the focus of the email. We’ve seen that this not only generates top-of-funnel leads, it also increases conversion rates for most prospecting emails we send. TIP: Another area where you can leverage email is in your email signature. We’ve always included a focus on content in our signature, and are currently testing the service Sigstr to make our email signatures do marketing work for us. 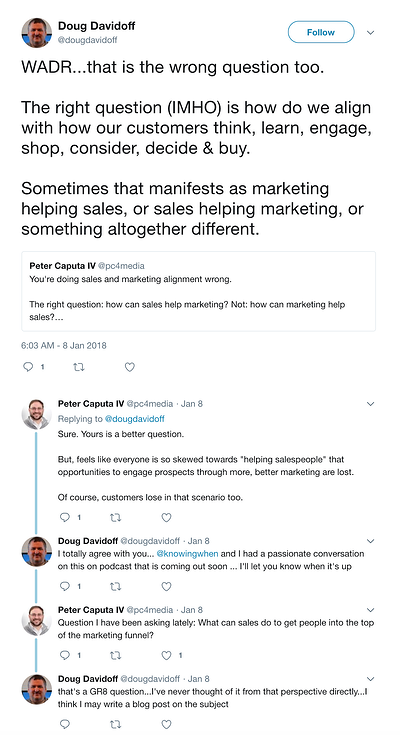 I’ve witnessed or listened to more sales and prospecting conversations than I care to admit, and it’s frustrating to see opportunities lost when the response to the immediate request isn’t affirmative. The next time you or one of your sale team is about to hang up the phone with someone you weren’t able to advance (or whose opportunity you lost), ask a non-sales question that helps you understand what is important to themt. Then offer to share relevant content that will help them (with no strings attached), and ask if they’d be okay with you adding them to your blog subscription/distribution list. This additional ask helps us to understand their situation better, and be able to better personalize marketing to them. Ah, social media, the place where salespeople go to hide when they don’t want to do real work. While social media activity done badly masquerades as progress, when it’s done properly, it’s quite effective at generating top-of-funnel engagement. The problem that I’ve seen with most “social selling” is that it’s too heavily focused on promotion or direct prospecting. That kind of social media use is the modern-day equivalent of the trade show sales rep who shows up and says, “Here’s my card,” to anyone who will acknowledge their existence. A far more effective strategy is to engage: be a human; share insights (not just rants) that contribute to the greater conversation, and find ways to be helpful. Social media (like all things) requires investment in building relevant relationships before it pays off with sales opportunities and revenue. As with most things in business, ideas are great, but the devil lies in the execution. There’s no question that salespeople encounter numerous top-of-funnel engagement opportunities every day. The challenge is turning those “touches” into identified names at the top of the funnel. It must be easy for sales reps to add and code names in the database/CRM so they’re managed properly. The process that will be used must be clearly communicated to sales reps, so they’re comfortable with how things will work and understand the impact and value of the process. The process must be communicated to marketing (and other players) as well, lest they inflict poor lead-nurturing experiences on the prospect. I know a situation where a business owner was very angry that sales reps weren’t adding new names to their database. When I talked with the reps, they had valid reasons why they didn’t. First, names in the database got deluged by overzealous marketers, and second, if one name turned into a lead, it would more likely than not be assigned to a different rep, with no credit or acknowledgement to the rep who originally added the name. No one in a company has more opportunity to create meaningful engagements at the top of the funnel than the sales team. A strong process, with reinforcement can enable you to capture that value and generate more profitable demand for your business in the future.